One of the fastest-growing custom workshops in Italy is Extemporae, based in the Varese region that’s also home to MV Agusta and Husqvarna. 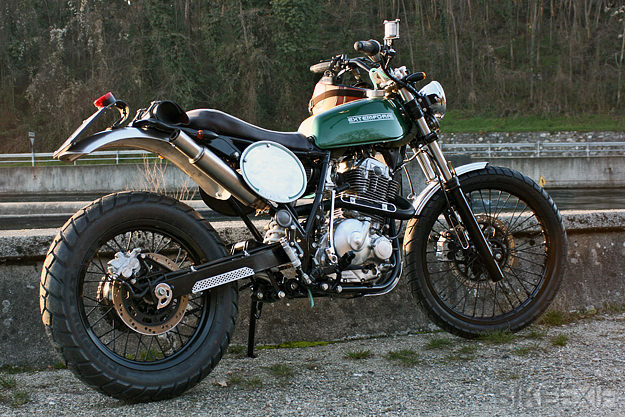 The company’s first two builds, a Yamaha TT600 and a XT550, were published in the influential Italian magazine Riders in 2011—and from that point on, there was no looking back. 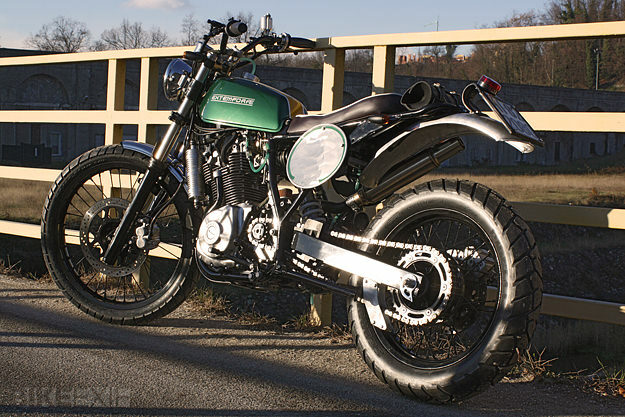 This is Extemporae’s latest, a 1994 Suzuki DR650 scrambler. The DR650 is one of those ‘sleeper’ bikes just begging for customization: Like the Honda Dominator, it’s an unsophisticated but effective all-rounder, and lends itself well to a diet and makeover. For this machine, Extemporae took inspiration from a car: the lightweight, stripped-down Caterham Seven. 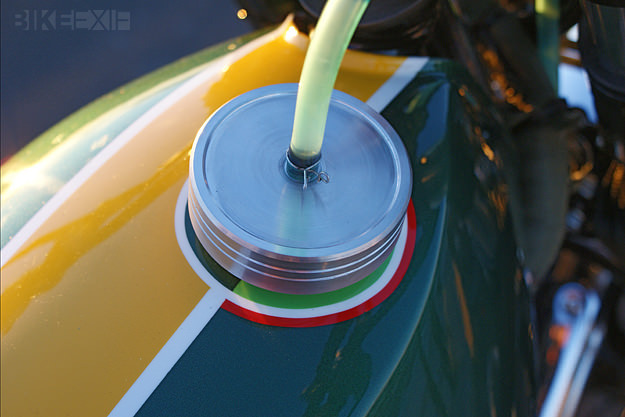 Hence the Caterham/Lotus-spec green paint and the emphasis on ‘adding lightness’. Up front, the chassis has been modified to take a 1970s Yamaha 400 tank, and at the back it’s been slimmed down to give a lower line and accommodate a hand-made seat unit. The bars are from an anonymous 70s dirt track racer, refinished in black. The front fork has been rebuilt and shortened and custom fenders fitted front and rear. 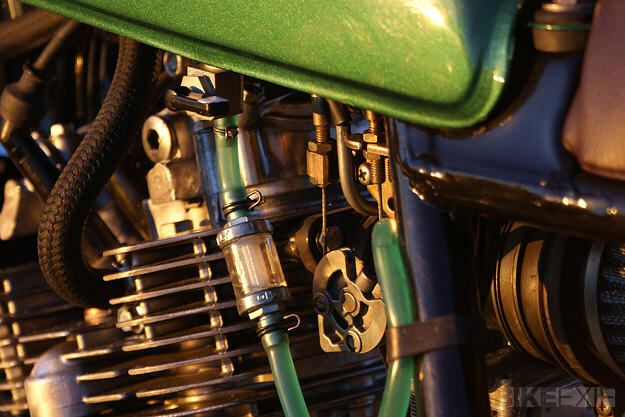 The overhauled engine is now hooked up to a cone-type air filter and Extemporae fabricated not only the exhaust system, but also the oil radiator. 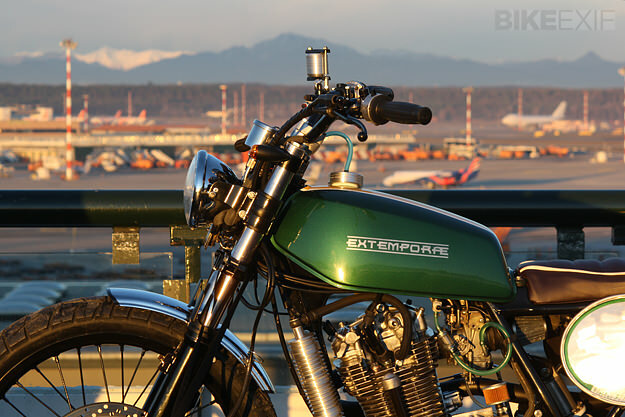 “This scrambler is simple, light, funny and cool,” say Extemporae’s founders, Alex and Paolo. I’ll second that, and hopefully we’ll see more Suzuki DR650 customs in the future. Keep an eye on Extemporae’s Facebook page to see what they come up with next.